Transforms census data, benefit design, and claim data into powerful business information for multiple functions, saving stakeholders time and expense. Our cloud-based business intelligence platform provides all parties with 24/7 access. The value of plan design changes has always been of interest at renewal time for employers. Changing plan designs to keep up with inflation and dampen renewal increases is sometimes an annual event. However, determining the value has been cumbersome – either ask the carrier for numerous options, use a table of pre-packaged plans, or, use the clumsy and approximate federal calculator. The third option, re-computing the entire claim data set under a different plan design seems accurate, but will require some intense resources and can be very misleading since the claims mix is erratic year to year. Last year’s claims are generally not the best estimate of next year’s claims. The phrase “Actuarial Value” embedded in the 2010 Accountable Care Act raised awareness and interest in this concept. Plans with a minimum Actuarial Value of 60%, were considered sufficient to avoid penalties. The ability for brokers and employers to make side-by-side comparisons of health insurance products — based on their actuarial value — provides great strategic advantage for plan modeling and financial planning of employee benefit plans. To read our full report on the Power of the Actuarial Value you can download it here. First to market – the nation’s first online actuarial value calculator since 2013. How does the ClearPATH Actuarial Calculator compare to the Federal Calculator? For each plan simulated, the value found using our calculator fell within two percentage points of the AV score estimated by the federal calculator. These results demonstrate the accuracy of ClearPATH, and they provide support for the validity and usefulness of the ClearPATH Actuarial Calculator. You can download our full report here. ClearPATH is a combination Actuarial Value Calculator, renewal modeling tool, and long term financial planner rolled into one comprehensive tool. This SaaS system allows for strategic planning with immediately financial feedback for plan design or other changes. Build unlimited number of scenarios and multi-year plan to achieve financial goals. Flexibility for renewal assumptions, migration measures, targeted budgets. Convenient output to MS Excel for custom presentations. Brokers can gain new clients by modeling prospective employers. TPA’s can offer ClearPATH across their entire block of groups. The METRO modeling tool is a full featured stop loss rate manual and proposal system built to help buyers take back control from sellers. This tool at the heart of the Home Court Stop Loss Exchange enables the actuaries representing the buyer to present prices to the stop loss markets and to drive the conversation about appropriate price. 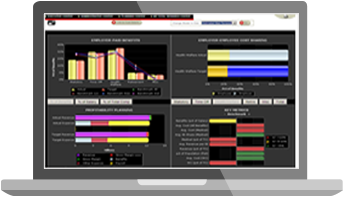 AKUNAWARE transforms historic payroll and HR data into forward-looking actionable business intelligence. Unleash the power of your back-office data and gain insight, productivity, transparency and Affordable Care Act compliance. For the first time ever, view all cost components of your organization's largest expense - Total Rewards - in one system. AKUNAWARE eliminates the need for individual companies to buy, deploy and maintain IT infrastructure or application software. Use current business and industry benchmarking data to model, measure, plan and report your progress. AKUNAWARE's Planning Center allows stakeholders to conduct predictive modeling by simply creating scenarios and changing assumptions to compare results in minutes. AKUNAWARE's best-in-class features will boost your employees' engagement, loyalty, retention, productivity, and level of appreciation too! Employees can view their personal package 24/7-365; at work and at home on their desktop, laptop, tablet and smart phone. Anyplace, anytime; even on vacation!